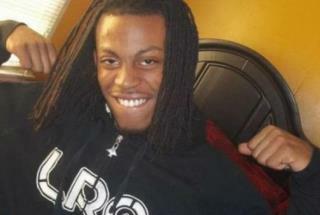 Chavis Carter: America's Next Trayvon Martin? (Newser) – If Trayvon Martin's death seems suspect, try Chavis Carter's: According to police, the 21-year-old killed himself while handcuffed in the back of a police car. Officers pulled over Carter last month in Jonesboro, Arkansas, and say he was carrying marijuana and little plastic bags often used to sell drugs. They checked his name on a police computer and found an outstanding warrant for shirking probation in a year-old drug case, reports the New York Daily News. This one is not as hard to explain as you might think.. First of all I don't quite know what makes a vehicle 'suspicious'. Certainly not because it was a ford or Chevy. Much more likely it was the three black males inside but that aside. When the police pulled the car over one of the men inside stashed a gun, probably under a seat. While the background check was going on Chavis called his girlfriend knowing the warrant would be found. With the warrant all three men were ordered out of the car and cuffed at which time the weed was found. Knowing they had the driver on weed and a warrant they were content to release the other two. Chavis was searched again and cuffed behind his back. No gun was found because he had no gun. With Chavis in the squad car a thorough search of the car was conducted. When Marsh found the gun he went to the squad car to question Chavis about it. The exchange got heated. Marsh brandishing the gun while Chavis accused him of planting it. Marsh threatened him but the shooting was accidental. Marsh then rejoined his partner at the other squad car where he claimed to have heard something. They returned to his car where they found Chavis shot. Marsh then tried to remove the handcuffs in order to float the story that Chavis had shot himself. His attempts to remove the cuffs was also a chance to get chavis's fingerprints on the gun which may have belonged to one of the other suspects. There's an updated story from the local ABC affiliate KAIT-TV in Jonesboro, Arkansas. http://www.kait8.com/story/19149968/police-release-more-information-in-chavis-carter-death Based on details in this story and in one of the linked documents, I'm starting to see how the police explanation of this COULD be more possible/plausible. Here's a rather lengthy excerpt from the police news release: === "After this initial contact was made the individual whose identity was unestablished (Carter A.K.A. Laryan Bowman) was escorted to the back-up unit and placed in the rear of the car without hand-cuffs. The second officer then spoke with this subject who revealed to him his real name Chavis Chacobie Carter. At this point he was left in the police unit as the officers confirmed his identity and learned that he had an active warrant out of Mississippi. "Contact was reestablished with the driver and other passenger. The driver gave the first responding officer consent to search his vehicle. A search of the vehicle by the officers revealed a set of electronic scales, residual marijuana and a quart sized zip lock bag containing about 3-4 ounces of white crystalline powder (suspected to be sugar). "Upon discovery of the items and confirmation of the warrant the back-up officer returned to his vehicle where Carter was detained (un-handcuffed), removed him from the vehicle cuffed him behind his back and searched his person again. Carter was then returned to the rear of the second police unit." (Source: http://www.kait8.com/link/577939/pdf-jpd-press-release-on-chavis-carter-investigation) ===Here's how it is technically possible that Carter did shoot himself:1. The officer legitimately missed the gun on the first pat down/frisk. This would be a HUGE mistake that could have gotten the arresting officer and his backup officer killed. But, it does happen.2. Carter - knowing the officers were about to discover his drugs and drug paraphernalia (which would have qualified him for a felony conviction) knew he also had an outstanding warrant. Perhaps, in a moment of clarity, he decided it would NOT be a good idea to also be busted with a gun in his possession. (Gun possession while dealing drugs in Arkansas can equal a federal prison sentence, depending on your history.) So he (very logically) tried to hide the gun in the back seat of the patrol car. Remember, he was NOT cuffed at this time.3. Carter (un-cuffed) was brought out of the car, searched a second time (no gun to find now, it's hidden in the patrol car's back seat) handcuffed and returned to the back seat of the patrol car. 4. Carter retrieves the handgun from its hiding place in the vehicle and then shoots himself. For this to happen Carter would almost HAVE to have been cuffed with old-style, chain-linked handcuffs. That would have given him the flexibility to twist his left wrist behind his back into the "hammerlock" position. With his right hand just below his shoulder, he could have leaned his head to the right, giving himself a somewhat clear shot to the temple. To determine whether he would have been able to make contact between the temple and muzzle, you would have to know both the length of his arm and his height. His relative flexibility would factor in, as would his girth. Before the flame wars begin, please note I am not saying that this IS what happened. I'm saying that, based on the new information that's available, it is now at least plausible that the officers could be telling the truth. For their sakes, and for the peace of Jonesboro, I truly hope the dash cam video absolutely confirms what they are saying. BTW: On that note, we also learned from this latest report that there are not one, but TWO dashcam videos, with audio. That means there's a lot more technical information available that would make it very unlikely that someone in a medium-sized municipal police department could tamper with the videos and not get caught. So, when we finally get to see these recordings, it's very probable that what we see will be what we get, so to speak. From the police statement:"These witness statements are consistent with the statements of the officers and the evidence reflected by the dashcam video of the responding officer along with audio evidence from the back-up officer. The statements and video/audio evidence account for the officers actions from the beginning of the stop until the arrival of the ambulance and indicate that neither officer removed his weapon, fired a shot or was in a position to enter the vehicle where Carter was detained in a manner that would allow for them to injure Carter. "The second sad part of this, after Mr. Carter's death, is that - if this is what happened - the officer who missed the gun will, in all likelihood, be sued by Mr. Carter's survivors. That suit will be settled out of court and the officer's career is, in all probability, over.The big question that will remain regardless of the outcome of the investigation is, "Why?" Why would Mr. Carter kill himself over this arrest? Perhaps the thought of a lengthy prison term was intolerable to him. We will never know.